The RM5 Evolution is an electronic coin validator for Australian coins. It is made in Italy and is a very high quality product. The RM5 Evolution is a Top Load/Bottom Reject mechanism, but can be adapted to be front loading through the use of an RM5 faceplate, however it will always be bottom rejecting. 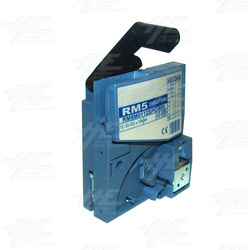 RM5 Evolution validators come in ten different models. The RM5M01 model currently accepts Australian 10c, 20c, 50c, $1 and $2 coins, but can manage up to six separate coin values if programmed with a hand held programmer or the 'Clone 5' PC software. If the user wishes to separate coins and tokens, the RM521 can be used in conjunction with a coin separator that is programmed via the Clone 5 software. Coin channels 1 to 6 can be manually blocked depending on coins to be accepted by operating the respective dip switch settings. For access to channels 7 to 59, the Clone 5 software can be used. The Clone 5 software can also allow the user to set credit price and bonus level parameters. The RM5 Evolution boasts a number of security features including, an anti-fishing and intrusion devices, a wire cutting blade, and a number of magnetic and optic sensors that recognise coin diameter, mass and material. An automatic sensor system is also in place to compensate for any variation in temperature, tension or light. The RM5 Evolution is designed to fully meet the requirements of the whole self service sector, and is suitable for nearly all vending and gaming applications. RM5 Evolution validators come in ten different models. The RM5M01 model currently accepts Australian 10c, 20c, 50c, $1 and $2 coins, but can manage up to six separate coin values if programmed with a hand held programmer or the 'Clone 5' PC software. If the user wishes to separate coins and tokens, the RM521 can be used in conjunction with a coin separator that is programmed via the Clone 5 software. Coin channels 1 to 6 can be manually blocked depending on coins to be accepted by operating the respective dip switch settings. For access to channels 7 to 59, the Clone 5 software can be used. The Clone 5 software can also allow the user to set credit price and bonus level parameters. The RM5 Evolution boasts a number of security features including, an anti-fishing and intrusion devices, a wire cutting blade, and a number of magnetic and optic sensors that recognise coin diameter, mass and material. An automatic sensor system is also in place to compensate for any variation in temperature, tension or light. The RM5 Evolution is designed to fully meet the requirements of the whole self service sector, and is suitable for nearly all vending and gaming applications. Operating Temperature: 0C-55C from 10%-75% of non condensed humidity.